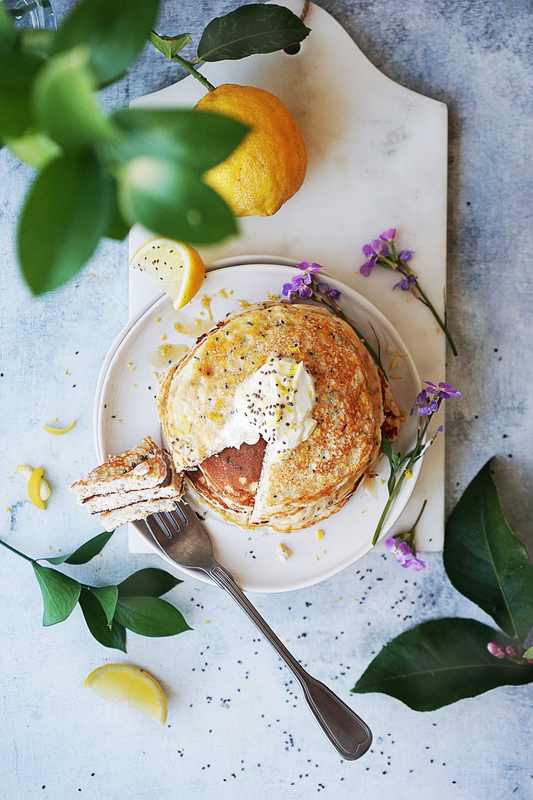 Make these Lemon Chia Seed Protein Pancakes! They are healthy, easy to make and delicious with only 290 calories per serving. Easy to double the recipe for two! Note: This was originally posted on Jan 22, 2015 and now it has been updated with new photos. Just like 70% of the population, I went on a diet at the beginning of the year. I really despise the word diet. It should be “lifestyle change”, but for me I’ve been living this lifestyle for almost 7 years! I don’t smoke and rarely drink booze (okay, only on a few social occasions where I like to get tipsy – because one drink will do that to me lol!). Honestly I indulged a lot the last months of the year and especially the holidays. And I mean A LOT! This left me with some unwanted fluffy weight and that’s not O.K. The older we get the harder it is to take it off so I need to act now before it’s starts creeping on me one pound at the time. I’ll be sharing many more recipes soon that are figure-friendly along with their calorie count. This will help you and I stay on track. (Note: My protein powder is 31 g for 1 serving for 120 calories/1g fat/3g carbs/24g protein (Gold Standard 100% Whey ) Weigh your portion instead of using your scoop to measure. Use the recommended grams for 1 serving of your favorite protein powder. However, your protein powder may have a different amount of calories and will affect the amount of calories noted for this recipe. Heat a small nonstick pan over medium/low and coat with cooking spray. Pour 1/4 cup of the batter onto the pan. Cook until bubbles break the surface of the pancakes, and the undersides are golden brown, about 1 minute. Flip with a spatula and cook about 1 minute more on the second side. 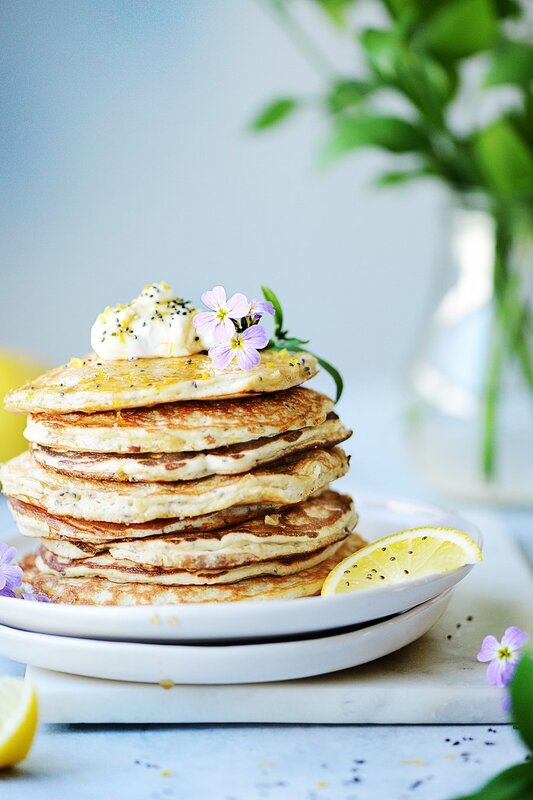 Here is another idea for Protein Pancakes! YUMMY!!! You’ve inspired a new creation for me as well. I hear you on the holiday indulgence. I’m trying to recover from too much of everything myself. Hi Caren! 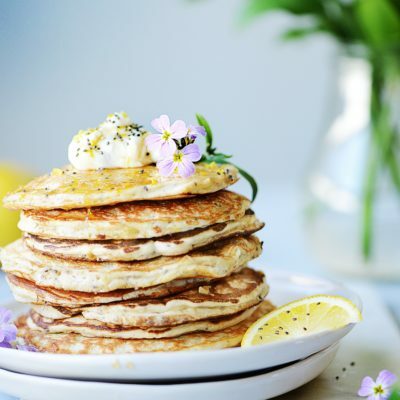 You can definitely add some of this stuff to your amazing pancakes! I hope you have a great weekend! Hi Pushpa! You are very welcome! You can use one whole egg for two egg whites. The calories will change but I’m sure they’ll be yummy too! If you care about calories of course 😉 (2 egg whites = 34 calories – 1 whole large egg = 70 calories). Enjoy! 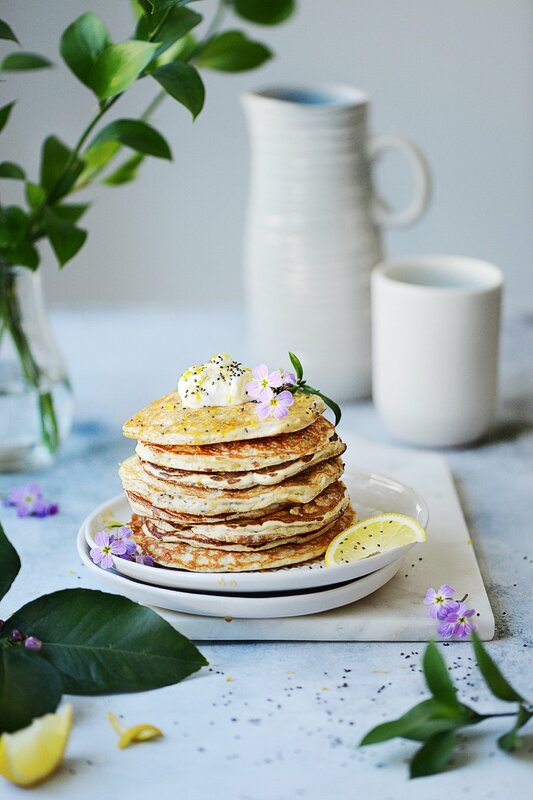 I’m a healthy eater too, and always love finding new weekend brunch recipes that make me feel like I’m indulging without actually going overboard. 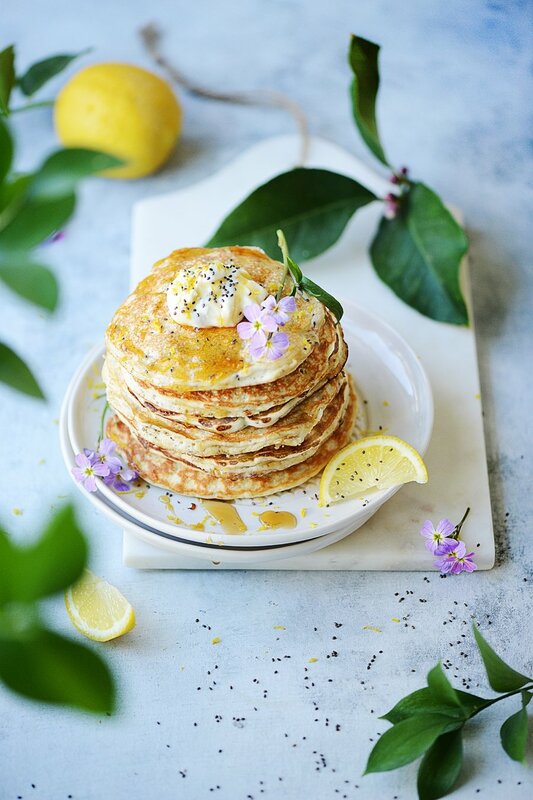 These pancakes look like jus the thing! Beautiful photos, too. I love your recipes Dara! It’s great to eat healthy but leave some room for a treat here and there. I think that’s the secret to be healthy & stay in shape. Thanks so much for stopping by! Mmm! These look so delicious! Thank you so much for this recipe. Made these this morning……Oh these are good! I weighed out the ingredients like you suggested and I used liquid egg whites. I should have noticed to cook them Medium/Low……mine cooked a little darker….but they were still wonderful and very filling! I’m thinking next time I will try these with raspberries instead of bananas and use chocolate protein powder and leave out the lemon. What do you think? I made these with one whole egg and quinoa protein powder. They cooked really fast and held together beautifully, flipping them was easy. They were quite yummy, however I found that the banana and lemon flavors sort of competed with each other and that was the downside. I think replacing the banana with a more neutral flavor, like ricotta or something, would really make then outstanding. Totally just made these. Totally just devoured them. Legit! Oh I love your substitutions Lori! I love coconut flour too and a little bit goes a long way! I’m so glad you liked them and thanks for letting me know how they came out. Have a great day! Great recipe!! I squeezed some blueberries in the mix to get some juice and made them as waffles. Ate them with a bit of peanut butter and maple syrup. Super yummy and guilt free! Definitely bookmarking this recipe for next brunch! Hi Steven! Yes of course you can use wheat flour. It will give it a more nutty taste which I think it will be fabulous! Enjoy! Also, I don’t have a scale … @ how many bananas? 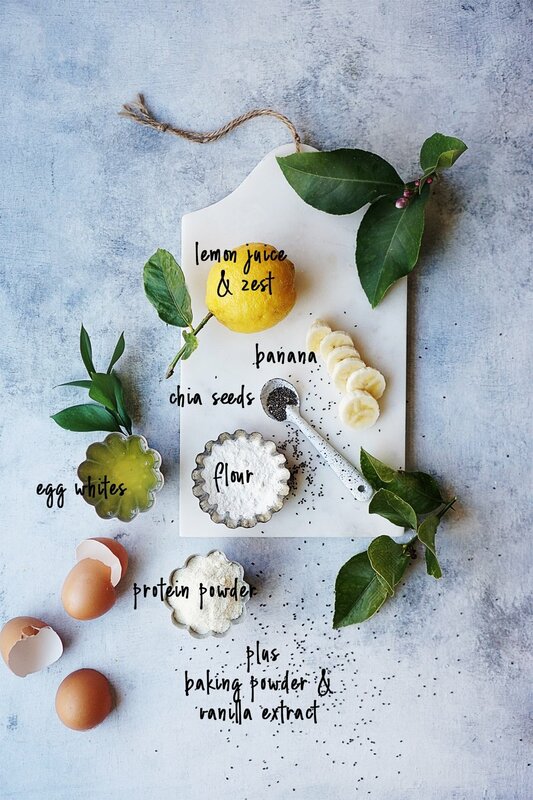 I don’t like bananas, can this recipe be done without them? Would I need to add something else to take its place for the consistency of the mixture or can I just miss them out? Also, would the Chai seeds need to be crushed first? How have I only just discovered this blog! I made these for my breakfast this morning and they were beautiful. The first protein pancake I have successfully made and really enjoyed! Seen so many other recipes on here I want to try now – great work! These were absolutely delicious, great recipe!